Vow renewal invitations with unique illustrations, personalized and custom printed with your details for renewing your vows. Popular designs include winter vow renewal invitations, sunflower vow renewal invitations, autumn vow renewal invitations, beach vow renewal invitations, and more. 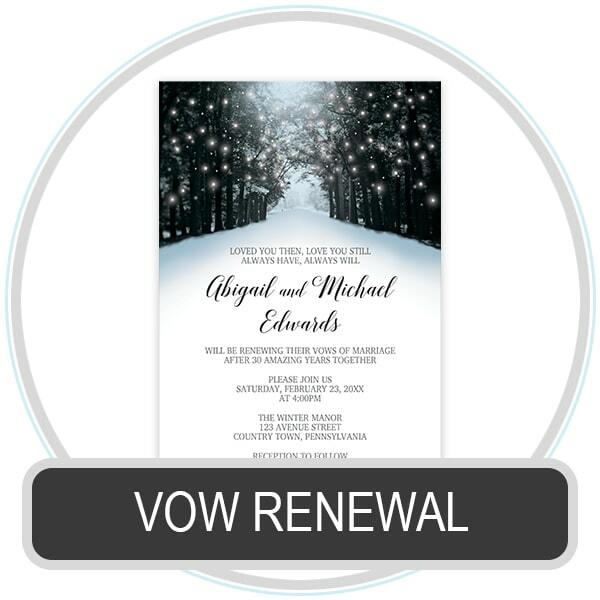 Each vow renewal invitation design has an optional matching RSVP card. Provide the wording you wish to use on your invitations with your order. The wording you use may be different than the sample image shown. With your invitation order, you are given a complimentary proofing process with the Designer to get everything just right. You will be emailed a proof image of your invitations with your wording, post-purchase, for your review and approval before your vow renewal invitations are printed.